Alphabet has taken over Google - but does this new structure mean people will stop 'googling' and start 'alphabetting?' Paul Nelson argues on Mumbrella that this change is more than skin deep. Read the full article on Mumbrella here. Despite the omnipresence of the Google brand we argue the recent logo change is at best peripheral compared to the changes made at a brand architecture level. The revised organisation of its brands and its creation of Alphabet means Google escapes the constant market and investor scrutiny and is freed up to focus on what it does best. This is the main game – the logo change is really summed up improving scalability and readability on digital devices – and after 16 years it was due for a refresh. Over the past few weeks, there has been considerable commentary in the press about the change of structure at Google, and its adoption of Alphabet as a name for the new parent. The transition within Google – Alphabet – culminated in Tuesday night’s launch of the new Google logo. Prior to the logo launch, much of the commentary had surrounded the choice of the name ‘Alphabet’, and the fact that the name was not universally well-received and not available as a clear URL. Again, this is peripheral in our view. What some of the commentators were overlooking is that this shift to Alphabet is about something far more significant than simply choosing a new name that either is either popular or not. The move to Alphabet signals a fundamental shift in the way Google – or rather, Alphabet – has chosen to structure its organisation and its brand architecture, in order to prepare for future acquisitions and expansion into new markets. Yesterday, with the launch of the new Google logo, people were back to talking about Google. Do we like the San Serif font? Do we dislike the San Serif font? Have they moved far enough? Have they moved too far? But in a sense this is not that material, any more than it matters that the Alphabet URL isn’t clear and available. What matters is that under the new Alphabet brand architecture, Google now has ‘permission’ to change its logo, to change its corporate identity and to highlight its focus on sourcing and sorting information, without impacting the broader scope of Alphabet’s interests. The creation of Alphabet has enabled Google to operate in the sphere which it knows best – to be single-minded – without limiting the broader business’ growth trajectory. 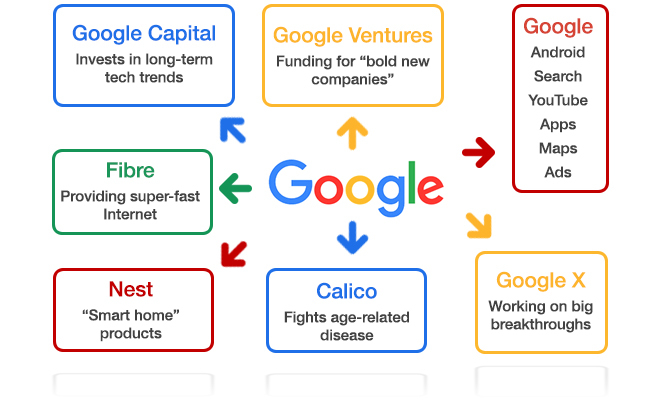 Under this new architecture, Google will retain search, YouTube and most of the biggest divisions while smaller operations such as Nest home appliances, life sciences, drone deliveries and venture capital investments will operate as individual companies. Alphabet is essentially a corporate holding company and never consumer facing – consumers won’t start ‘Alphabetting’ any time soon. Google’s co-founder Larry Page has long been keen to explore new areas for growth and less interested in creating incremental improvements to Gmail. He’s made no secret of wanting to explore transportation, connectivity and life itself. Over the years many business analysts have enquired as to the relevance of these new acquisitions and how they align to Google’s mission, now Page can honestly and confidently answer, ‘they don’t’.